Give your yard a head start with a professional spring cleanup. Allow your lawn the ability to breathe again and tidy up your yard. This is a great way getting over “Spring Fever” and is typically scheduled in April and May after snow melt and ground has thawed out. Our aeration, power raking and edging equipment is sterilized after each yard to minimize potential of lawn disease cross contamination. Spring is also a great time to fix that bare spot on your lawn or to overseed and topdress. We can offer the right solution depending on your budget and desired level of improvement. Gates, or any pass-through passages require a 34 inch minimum clearance in order to provide all services. In case you have an in-ground irrigation and/or wiring system you will need to mark any lawn sprinkler heads etc. with marking flags. This is generally a very busy season as many homeowners try to wrap up their yard projects. We will gladly help you making sure everything gets finished before the snow flies. 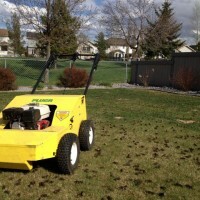 One of the most important service for your lawn is a proper leaf cleanup. This insures the lawn gets sufficient oxygen throughout the winter…even with a foot of snow on top. Otherwise it will suffocate under a thick layer of wet leaves. We provide leaf cleanups for the entire property or just your lawn area. If you want to give your lawn a special treat now is the perfect time to apply a thin layer of professionally blended compost, also called topdressing. This will give your lawn and soil a boost of nutrients to strengthen it before winter and give a head start coming spring. The application will outperform any fertilizer and improve not only the soil system but also keep your lawn green when your neighbour’s lawn is already brown and dormant.